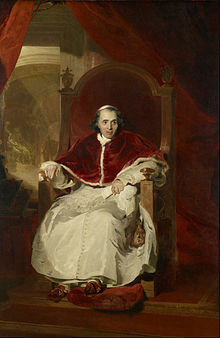 Pope Pius VII (Latin: Pius Septimus; 14 August 1742 – 20 August 1823), born Barnaba Niccolò Maria Luigi Chiaramonti, was an Italian priest of the Roman Catholic Church and the 252nd Pope from 14 March 1800 to 20 August 1823. Chiaramonti was born at Cesena, the son of Count Scipione Chiaramonti. His mother, Giovanna was related to the Braschi family. At the age of 16, he joined the Benedictine Order in 1756; and he was called Brother Gregory. Chiaramonte was ordained on 21 September 1765. In 1782, Pius VI made Brother Gregory Bishop of Tivoli, which is near Rome. Later, he became the Bishop of Imola. Pius VI raised Bishop Chiaramonte to the rank of Cardinal in 1785. The see (titular church) of Cardinal Chiaramonte was the Basilica of St. Callistus. Cardinal Chiaramonti was elected pope on March 14 1800; and he chose to be called Pius VII. He appointed Ercole Consalvi as his Secretary of State. Pius traveled from Rome to Paris to crown Napoleon as Emperor of the French in 1804. Before leaving Rome, he signed abdication papers which would take effect if he were put in prison in France. He was not put in prison; and he did not abdicate. Pius VII's monument (1831) in St. Peter's Basilica, Rome, is by the Danish sculptor Bertel Thorvaldsen. ↑ 2.0 2.1 2.2 2.3 2.4 2.5 2.6 "Pope Pius VII," Catholic Encyclopedia; retrieved 2011-10-27. ↑ 3.0 3.1 3.2 Penny Cyclopaedia of the Society for the Diffusion of Useful Knowledge. C. Knight. 1840. pp. 201–203. ↑ Giga-Catholic Information (GCatholic), Pope Pius VII; retrieved 2011-11-01. ↑ Chisholm, Hugh (1911). Encyclopedia Britannica: A Dictionary of Arts, Sciences, Literature and General Information. University Press. pp. 686–687. ↑ "Abdication," Catholic Encyclopedia; retrieved 2013-2-11. "Pope Pius VII". Catholic Encyclopedia. New York: Robert Appleton Company. 1913. This page was last changed on 2 March 2018, at 20:15.